GP250 ONT's are GPON network access devices that provide users with high bandwidth Tripple Play Internet / Voice / Video services. Four products make a complete range of solutions with a choice of Ethernet ports, Wi-Fi, VoIP and CATV options. GP250 ONT's are totaly plug-and-play. They connect automaticaly to GP2500 OLT without any setting requirement. 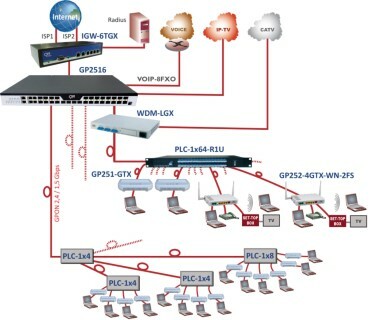 GP250 ONT are fully controlled by the GP2500 OLT. GPON is an optical access network technology that enables significant cost savings thanks to straight forward installation and multiple user connections over a single fiber infrastructure. CXR GP250 ONT's are higly appreciated for their best value for price, high quality and broad choice of user communication interfaces. Two OLT products are offered to connect to either 8 or 16 GPON lines and up to 2,048 GP250 ONT's and users.